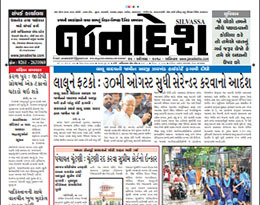 Janadesh - Surat edition is a Daily Gujarati Newspaper. It is a Newspaper in the General Interest category. There are 13 Gujarati General Interest Newspapers in Surat. Janadesh - Surat edition is ranked 5 among other Gujarati General Interest Newspapers in Surat. Display ads and Classified ads are the most common forms of Newspaper advertising in Janadesh - Surat edition. Newspaper advertising cost in Janadesh - Surat edition can be either obtained online here or through a Newspaper advertising agency in Surat like www.bookmyad.com. We can provide you with the best advertising rate for Janadesh 8 editions- Surat, Daman, Silvassa, Bharuch, Tapi, Dang, Jalgaon Editions. Best discounted rate for Janadesh - Surat Edition would depend on the ad size and advertiser category.